Freecharge is rocking now days.After providing so many loot offers like Rs 45 cashback on Rs 50 Recharge, Rs 50 cashback on Rs 50 Recharge. 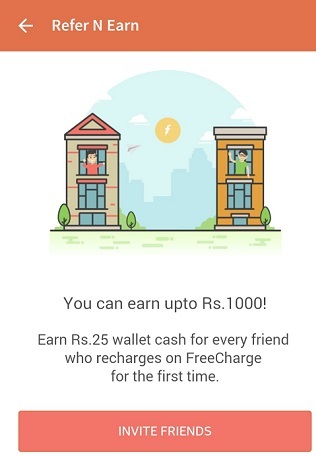 Freecharge now come up with super awesome Freecharge App Referral Program.In Freecharge Refer and Earn scheme all new users at Freecharge will get Rs 50 cashback on their first mobile recharge of minimum Rs 50 at Freecharge app.During this Freecharge Refer Promotion you will get Rs 45 Freecharge credits for each friend you refer to use Freecharge app. Validity for this Referral campaign is not known,better to use it now. Check more Freecharge New Users Coupons. Use new Freecharge ” Spin N Win ” feature to win free Freecharge credits. 2. Create new account OR login. 3. If new users at Freecharge then start mobile recharge for minimum Rs 50. 5. complete the payment and Rs. 45 cashback will be credited to your Freecharge account instantly. 4.Tap on invite Friends and share Referral code with your friends. Ask your friends to use your referral code during their first recharge of Rs 50.Your friend will get Rs 45 cashback after successful recharge and you will get Rs 45 Freecharge credits as a referral bonus for each referred friend. 1. New users will get Rs 45 cashback after mobile recharge of minimum Rs 50 using above mentioned referral code. 2. For each successful referral you will earn Rs 45 Freecharge wallet cash. 3. During the referral promotional period anyone can earn up to Rs 5000 Freecharge credits by referring friends. 4. Validity of the offer is not known. 98 Responses to "Freecharge Refer and Earn : Rs 25 Cashback on Your First Recharge"
Use this referral code RZ63X7B for cash back Rs 75. Hurry! aab freecharge mein kaunsa virtual card kaam kar raha hain Admin ??? sir ek aap say alag alag debit card say kr sakte h new user per?ya aap track hogi? I HAVE DESKTOP. WANT TO DO THIS WORK. I DO NOT ANDROID PHONE.I CAN DO GOOD REF FERAL BUSINESS.KINDLY GUIDE ME. you must have got email from freecharge, regarding why your friend don’t get cashback.